...until I saw my new little friend. I know that technically they've been out for a long time, but remember, it's new to you if you've never seen it before. I'm always checking the freezer sections of wherever I go, but usually it's the same old, same old. Not today. Cumberland Farms was ready for me and I was more than happy to plunk down a buck seventy-nine for 4.5 fluid ounces of anything that has Snickers in the title. I'm sorry I don't have a picture of the treat itself, but the picture on the package is actually pretty close. My ice cream layer actually looked just a bit thicker than what you see before you. I took my first bite and I was oh so happily confused. Do I inhale this tasty treat and cure the raging hunger? Or do I pace myself and try to savor every bite? Oh how this debate raged in my head....for all of the maybe 90 seconds it took me to eat this. I can't help it! I'm a snack addict who loves Snickers. Here's what I remember from my brief but very enjoyable snacking: The brownies were surprisingly good. They tasted fresh, had a nice consistency, and didn't feel dry to me at all. However, be warned, these are very nutty brownies. Instead of the nuts being in (or at least on top) of the ice cream, they are chopped up and mixed into the brownies. If you want to be real analytical about it, the chopped nuts were the only thing slowing me down. There's a lot of them and you don't want to take such a big bite that you're overwhelmed by these sharp little peanut bits - clarify: not sharp as in hurt you, but sharp as in they are hard to miss, they definitely get your attention. They tasted like respectably fresh quality peanuts, there is just no avoiding them ...not that I'm surprised by any of this since this is a Snickers treat after all. The ice cream slab in the middle was also nice and had a nice caramel swirl going through it. Now since this is an ice cream brownie, and not an ice cream bar, you're not going to get that same overall creamy treat that you would with the ice cream bar. This is not a bad thing. There is plenty of room on this planet for a variety of snickers treats. Hmmm, I'm struggling to find the right words here. It's Snickers on a nice soft brownie and it's good, real good, you need to try one! Ok, not the most elaborate argument, but you know what I mean. This is the same kind of quality treat as its ice cream bar brother and it's worthy of your attention. I'm dieing to try another one, but maybe when I'm not so hungry so that I can slow down and analyze it a bit more. What? You need one more reason? Ok, check out the nutritional facts below. So often these single serve freezer treats are not only a debatable deal, but they can have anywhere from 50-80% of your saturated fat for the day and no redeeming qualities. Not here. Sure, it's not super healthy, but all things consider, this is definitely another plus. Woohoo! Mmm that sounds awesome! 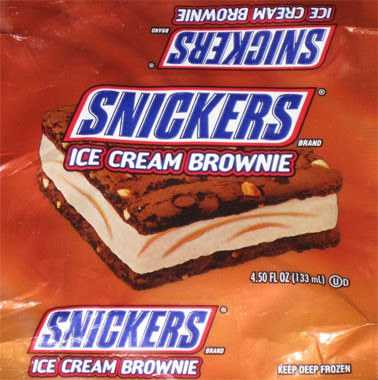 The Snickers ice cream bars have always been one of my favorites, I gotta try and find these! Never seen them before. I JUST discovered this treat while on vacation in Cabo San Lucas. LOVE IT. My husband and I can't find it anywhere in Northern California yet. It will be a sweet day when we do!